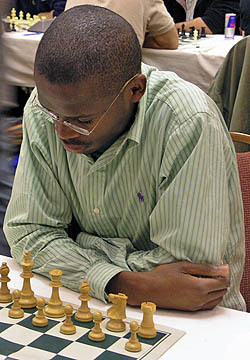 International Master Amon Simutowe is currently competing in the New Jersey Futurity International taking place July 7-11, 2007 at the Sheraton Parsippany Hotel. The field has 10 players with four Grandmasters. Simutowe is coming off an average performance at the World Open, but hopes to put together a string of good results in order to raise his ELO rating. This tournament follows a tradition of providing up-and-coming players (or title aspirants) with opportunities to earn norms. This is the next of several tournaments for the Zambian master as he stays on course to score a GM result. Simutowe stated that he was tired after the recently-ended World Open, but that he would be ready for battle. In the tournament field, there is a lot of variety from seasoned competitors like Leonid Yudasin to 15-year old Evan Ju, the 2007 U.S. Cadet Champion. The games are game/90 + 30 second delay. Coverage at http://www.njscf.org.